Whether it's suede, calf leather, vacchetta or nappa, many different luxury leather types are used in our accessories. The main differences are listed below to help you decide which type of quality leather is suitable for your needs. Used on our luxury leather belts. Full grain leather is produced from the top side of the hide. 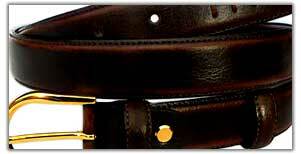 It is also used for our vegetable tanned hides, which gives it a very smooth and classic leather finish. The young age of this hide results in a smooth leather with a naturally embossed grain. It is one of the most expensive kinds used for accessories. This is a full grain leather with a strong and rich appearance. This is the strongest type of Italian leather and is very difficult to scratch. It is less supple than other types of designer leather. It has a very natural appearance which is often embossed with a fine grain pattern to give it a vintage style. Vegetable dyes are used on this expensive leather to soften the hide and give it a matte finish. It is soft to the touch and can appear very similar to goat leather. The dyes also can be used to produce a range of different colours. Cowhide vintage is tanned with vegetable dyes, much like cowhide smooth. Further techniques are then used to create an antique finish, leaving it with a weathered or casual look. Eel leather is very supple with a delicate pinstripe grain and must be worked on by hand. This exotic leather is increasingly used by leading fashion designers for luxury accessories. Although called "eel leather", it actually comes from the eel-like hagfish, a sea creature found at deep ocean depths. Both types are made from full grain calfskin. The embossing process heat presses grain patterns into the hide. Embossed leather exhibits a grainy pattern, while soft embossed is softer with more pebbly patterns. Soft embossed leather is also more supple than embossed. This is most often used for manufacturing jackets and wallets. Due to its thinness and flexibility it can mark quite easily, so it is often treated and waterproofed to reduce scratches and stains. A lot of the highest quality lamb leather comes from New Zealand. 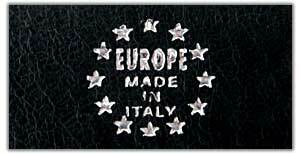 In Italy, nappa is a top quality leather used for luxury goods. It is expensive and cannot be extensively worked on since it is so pliable. Because it is not treated, small imperfections are often visible. Nappa linings are extremely light and retain warmth far better than other types of designer leather. Nubuck leather from Italy has a velvety texture similar to suede. However nubuck is an effect created by brushing the grain side, while suede is made from the underside. The fibers are also much shorter than suede, which makes it extremely soft to touch. Suede comes from the underside of the hide rather than the exterior. It is softer than full grain, containing brushed textures and open pores. Its thinness makes it suitable for vintage style accessories and luxury goods. It is often buffed and brushed to create a fuzzy surface. Vacchetta is similar in many ways to cowhide smooth, but it is made from calf leather rather than cowhide. 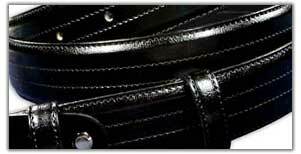 It is a very young leather used in mens fashion which is soft to touch and slowly darkens as it ages. 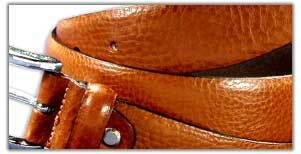 Vegetable tanned leather uses natural tannins from oak tree bark or other plants in the tanning process. It ages well and retains its shape over years of use, being commonly used on products requiring durability such as luggage or furniture.